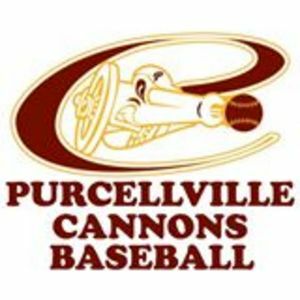 PURCELLVILLE, VIRGINIA-- One day after rallying late to defeat the Harrisonburg Turks on the road, the Purcellville Cannons fell victim to a late-inning comeback, too, as the Strasburg Express tallied three runs in the top of the ninth to defeat the hometown Cannons, 11-9, at Fireman's Field on Thursday night. The Cannons rallied from an early 6-run deficit to take the lead in the bottom of the eighth off Strasburg reliever Drew Avans. Jarrett Clymer's suicide squeeze bunt scored Diandre Amion and Colton Lightner followed with an RBI single to plate Tommy Ziegen which gave the Cannons a 9-8 lead. After allowing his first run of his 2-year tenure with the Cannons on Tuesday night in a one-run loss at Winchester, right-handed reliever Matt Kaster was called upon to nail down his first save of the summer but ultimately struggled. After a lead off double to Carter Pharis and a single by Michael Curry tied the game at 9, Kaster allowed an RBI triple to Tommy Richter (who entered the game with just one hit this year) to give Strasburg a 10-9 advantage. Richter came around to score just one pitch later on an RBI single by Donovan May to conclude the game's scoring. May and Pharis did the most damage off Purcellville pitching on the night, combining for seven hits in 9 at bats, four RBI, three doubles, three stolen bases and three runs scored. Cannons' starter Alex London could not feed off his last outing -- a 7-inning, 1-hit shutout in a 1-0 win over Front Royal on July 3rd-- and was roughed up by the division-leading Strasburg lineup. The Express took a 1-0 lead on a wild pitch in the first inning, then an RBI double by Pharis and a run-scoring ground out by Erick Delgado made it 4-0 one inning later. London's night ended in the fourth inning after back-to-back 2-out rbi doubles by Pharis and Tyler Green to give Strasburg a 7-1 lead. London was charged with all seven runs allowed in just 3 2/3 innings pitched but did not factor into the decision. After just two hits through the first three innings, the Cannons' offense came alive off Express starter Keegan James, scoring two runs in the fourth, fifth and sixth. An RBI single by DeAndre Amion made it a 7-2 game in the fourth, then a 2-run single by Onassis Matos off James cut Strasburg's lead to two, 7-5, after five full innings. James, who had not allowed more than one run in any outing this season, also earned a no decision, giving up a season-high five earned over five innings of work. The Express added a run in the top of the sixth on a sac fly by Green off Purcellville reliever Mike Tang to make it 8-5, but the Cannons closed the gap to one with two runs in the bottom of the frame on a sac fly by Eriq White to score Ziegen and a wild pitch that allowed PJ Harris to score. Harris went 3-5 in the loss with two doubles while Ziegen also collected three hits in five trips to the plate. Trailing by two in the bottom of the ninth, Amion lined a 1-out single to center field and was followed by a double by Harris two batters later to put the tying runs in scoring position. However, Clymer grounded out to end the game and Express reliever Brandon Quaranta nailed down the save and Strasburg's league-leading 23rd victory of the season. To make matters worse for the Cannons (12-20), on top of being three outs away from a second straight win over a division-leading squad, New Market defeated the Winchester Royals by a 12-6 score, meaning Purcellville fell two games behind the Rebels for the fourth and final playoff spot in the VBL North. The good news for the Cannons is that Friday offers a new day as they will stay at home to host the Woodstock River Bandits (9-22), who have lost four straight games and eight of their last 10. All-star right-hander Tyler Yancey is expected to make the transition from bullpen to starter when the River Bandits come to town. In 12 relieve appearances this season, Yancey has a 0-0 record and a 3.17 ERA. If history repeats itself, Yancey should fare well on the bump in his first start of the summer. In three games against the River Bandits this season, the three Cannons' starter (Pat Doudican, Zach Sloan and Matt Copley) have each earned wins, combining for a 0.86 ERA over a 21-innings span. For Woodstock, RHP Hunter Morgan gets the ball. In seven games this season (5 starts), Morgan is 2-2 with a 5.69 ERA. In his one previous outing against the Cannons, Morgan allowed just one earned run over six innings and earned a no-decision in a 5-2 Purcellville victory on July 1st. The Cannons are 3-0 against Woodstock this year, outscoring the River Bandits, 26-7.